He will be the tallest player in the Big Sky next season, and how good he is will have a huge impact on Joe O'Brien's coaching prospects. And I am guessing that most Big Sky fans have no idea who he is (before this post). 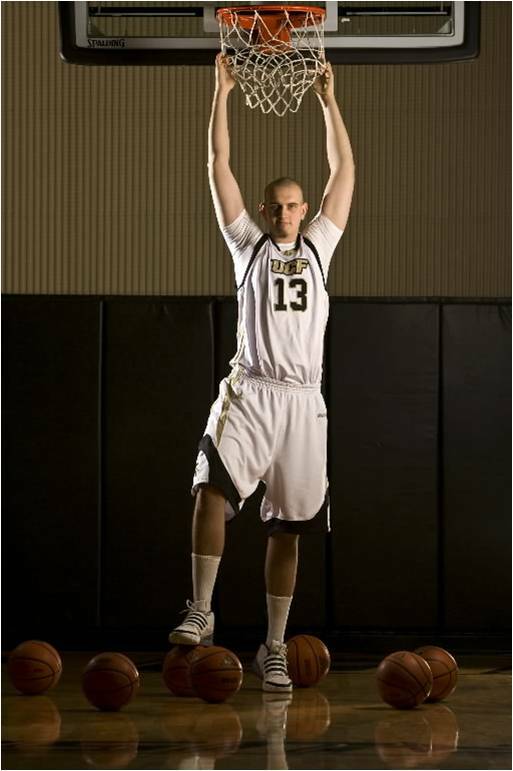 His name is Jakub Kusmieruk, and he is a 7'4'' big man that will be suiting up for Idaho State after sitting out last season. 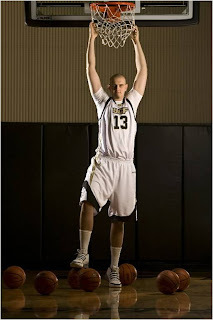 He played his first two years at Central Florida before transferring to Pocatello. There's nothing gimmicky about Kusmieruk's role on the team. O'Brien believes his mere presence on the floor will command double teams, thus freeing up other players for open looks. And the coach thinks the big guy is pretty effective with the ball in his hands, too. Conditioning should not be a problem, either; Kusmierek has slimmed down considerably since arriving at Idaho State last year weighing 315 pounds. "He's down to about 257 now," O'Brien said during a late August interview. "If we can keep him on the court something pretty close to 25 minutes a night, I think that's going to be huge for us." At 7'4'', it's hard not to think that he could have a big impact on games if he can stay out of foul trouble and stay conditioned well. Defensively, he will certainly make teams think twice about taking it to the rim. Plus, it is not hard to imagine him and Abner Moreira being one of the best rebounding duos in the Conference. Offensively, we will have to wait and see. If he really has enough skill to draw double teams, that will create some room for Idaho State shooters, which will be a huge boost to the offense (Idaho State was not a good outside shooting team last year). If Kusmieruk can become one of the better posts in the Big Sky, then maybe (just maybe) Idaho State will have a chance to be playing in the Big Sky Tournament. Bengals fans, what are you hearing/expecting from Kusmieruk? I expect he'll make things interesting on defense. On offense, I seriously doubt he'll need to be double teamed. I think he will make things very exciting! I hope he dunks a lot and gives the fans something to cheer about. At 7'4" how can he NOT draw a double team? This will certainly open up the newly improved outside shooting of Idaho State. Go ISU! Can't wait until Saturday. The ISJ sports blog wrote about a recent basketball practice, and the reporter was less than impressed with his offensive skills. Thank you for passing that link on to me, a lot of good stuff in there on the team! We will see, hopefully his game progresses a little more than that would suggest. At the very least, he should be a nice weapon for them defensively! My bet is that the big guy will lead ISU in at least one statistical category, disqualifications due to fouls.